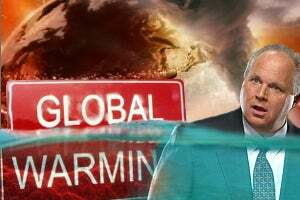 RUSH: Now to the Climate Change Stack. I’ve been alluding to this, and here’s the value of this. You know, when you boil it down, folks, what is climate change? Climate change is a political issue. It is not scientific fact. It is not settled science. It requires them to say they have a “consensus of scientists” that agree that X = Y = Z. But in science there is no consensus because scientific reality is not up for a vote. Water is H2O. It’s not something else. The earth is round, it’s not flat, and if somebody thinks it’s flat and you put it up for a vote, it doesn’t mean that the earth is round because there’s a consensus of scientists who say so. And then we’ll have a heat wave and they’ll say, “See? See? Climate change!” Wait a minute. You said it’s not gonna happen for 20 or 30 years? What do you mean, ‘See? See? '” It’s nothing but politics. But here is the clincher. What is the blame? What is the cause? The scientific consensus that tries to make you and particularly your children believe that there is climate change, what is the cause? It is the advanced lifestyle of the United States of America that is directly to blame for climate change. Oh, yes, it is. It’s our SUVs. It’s our industrialization. It is the use of fossil fuels. Climate change is the fault of advanced civilizations, in their telling. They have to guilt somebody. They have to make somebody feel responsible so that they can make those people change their behavior and change the way they vote and change their position on issues. And the climate change crowd wants everybody voting liberal Democrat for expanding — never-ending expanding — government, massive tax increases, and restrictions in regulations on private sector businesses, because all of those things are responsible for the destruction of the planet! You’ll note it’s not the ChiComs doing it. It’s not some poor little communist country with pollution out the wazoo. It’s us, and they have succeeded in persuading a bunch of skulls full of mush that by the time they are 65, the earth may not be able to support human life, that it will be too hot and that people’s blood will boil. So it’s in this scenario that I examine every climate change story. They are routinely found on tech media. The people in tech media think they’re all scientists. They love science fiction; they love science. They think everything about themselves is scientific. So first up is a story here from our buddy Marc Morano, our old “man in Washington” of the TV show. He now runs a website called Climate Depot, and he publishes the result of the new study that says, “STUDY: Concern Over Climate Change Linked to Depression, Anxiety — ‘Restless nights, feelings of loneliness and lethargy.‘ … Those hit hardest are women and people with low incomes who worry about the planet’s long-term health, said the study published this week in the journal Global Environmental Change. “Symptoms” of this particular psychological condition “include restless nights, feelings of loneliness and lethargy. ‘Climate change is a persistent global stressor,’ Sabrina Helm, lead author of the paper and professor of family and consumer sciences at the University of Arizona, said.” The Canadian Press: “A U.S. Navy Ship Is Trapped in Montreal Until Spring Due to Icy Waters — A newly commissioned Navy warship will be wintering in Montreal after its journey to Florida was interrupted by cold and ice. “A Navy spokeswoman says the USS Little Rock was commissioned in Buffalo on Dec. 16 and was expected to make its way to its home port in Mayport, Florida. Instead,” it’s caught in ice since Christmas Eve in Montreal, and it will not thaw sufficiently for this ship to move until mid-March. So, the planet is heating up to the point our blood’s gonna boil, or how does that coincide with a Navy ship “trapped in Montreal until spring due to icy waters”? Oh. So, see, what’s happening is it really isn’t warming up, folks. There hasn’t been any significant it can’t remember now 17 years, so they have to keep coming up with reasons why their models are wrong, and it turns out now that we are putting too much pollution up there and it’s cooling the planet like volcanic ash does. It prevents the destructive heat from reaching us. So if we clean up pollution, if we get rid of the pollution, we could kill ourselves! That’s what this story is. The next story is from a tech blog. So anything we do to fix climate change could make it worse! By blasting aerosols into the sky. “Global warming is a pressing problem,” it says, “and some scientists believe that sending a plane to spray sulfate aerosols into the sky will help cool down the Earth. In a study published today in the journal Nature Ecology & Evolution” one of my favorite magazines, “researchers used models” here we go again with models “to predict what would happen if we sprayed the aerosols for 50 years…” You know what would happen? We would cause massive global cooling that they couldn’t stop. So yet another brilliant effort, a brilliant plan to stop the warming: Spraying aerosols into the atmosphere for 50 years could end up killing us all by freezing us to death. I’m not reading parodies, I’m not reading satire, I’m reading actual news stories written by people who believe all of this. “CNN Claim That an Unmonitored Asteroid Could Slam into Earth During Government Shutdown Is Debunked.” Did you know that CNN was reporting this? CNN was reporting last week that an unmonitored asteroid could slam into earth during the government shutdown. But that claim of CNN’s was debunked by other scientists. An unmonitored asteroid is gonna cram us, ram us, during the government shutdown. Why? ‘Cause it was mad! The asteroid was livid that we were closing the borders to illegal immigrants.